Former UW-Eau Claire professor and administrator Vicki Lord Larson, who died on Jan. 31, donated these 16 acclaimed prints by Charles Peterson to the university. The works, from Peterson’s Memories Collection, will be on display in the university’s Schofield Hall. View more photos at LeaderTelegramPhotos.com. Interim Chancellor Vicki Lord Larson stood next to a bronze wall sculpture presented to her on May 10, 2006, during a program in UW-Eau Claire’s Davies Center celebrating her work as interim chancellor. The bronze work was created by Eau Claire artist Robert Gehrke. Whether working as a professor, administrator or interim chancellor at UW-Eau Claire, Vicki Lord Larson was committed to and passionate about the university’s academics, those who knew and worked with her said. Now Lord Larson, who died on Jan. 31 at age 74, will live on at the school she cherished, thanks in part to a series of limited-edition prints that have garnered national and international acclaim. As part of her endowment to the university’s Foundation, Lord Larson donated 16 signed prints by Charles Peterson, one of the leading artists in the limited-edition print industry whose works are highly valued. Peterson, 91, lives in the Door County area in eastern Wisconsin. His accolades are numerous and include an award last year from the Wisconsin Arts Commission as an arts educator and esteemed artist. The American Academy of Arts has exhibited his work, and U.S. Art Magazine listed him among the top 10 artists in the print industry nationally. The prints Lord Larson donated to UW-Eau Claire are from his Memories Collection and depict slices of American life via interior and exterior scenes of homes, businesses, outdoor scenes and other locations, interspersed with faded images of people or other objects that once would have inhabited those places. Peterson’s prints will hang in the College of Arts and Sciences area on the second floor of Schofield Hall, the university’s administration building and a location Lord Larson once inhabited when she worked there. 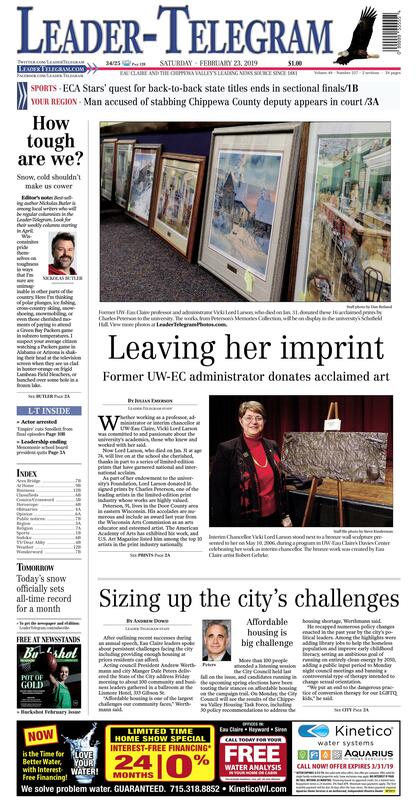 She requested that the prints not be split up, said Kimera Way, executive director of the UW-Eau Claire Foundation. “Given that Vicki had such passion for the academic enterprise of the university, we believe she would be most pleased to have her collection of prints hung in the Arts and Sciences dean’s office,” Way said. Jim met Peterson several times, Way said, further cementing his affinity for those prints. Lord Larson also donated other works of art to the university; two paintings by Emilian Glocar, a former priest who lived in Eau Claire from the early 1960s until 1982; and bronze artwork by Eau Claire artist Robert Gehrke, who graduated from UW-Eau Claire and died recently. Gehrke’s work was presented to Lord Larson when she stepped down from her interim chancellor job in 2006 and hangs with a dedication plaque for a hall joining the university’s McIntyre Library to Schofield Hall. That space was named Vicki Lord Larson Hall in her honor earlier this month. McIntyre Library staff members manage the university’s art collection, and library director Jill Markgraf said the prints are a tribute to Lord Larson, who was named interim chancellor in 2005, transitioning UW-Eau Claire between former chancellors Donald Mash and Brian Levin-Stankevich. The Peterson prints are notable in part because of the contrast between the scenes depicted and the faded figures depicting the history of those locations. “That’s why we love them,” Way said of the prints. In addition to her art donations, Lord Larson left the university Foundation what Way termed “a substantial estate gift” that will pay for a number of faculty/student collaborative research efforts. She also gave the foundation other personal items, including a piano that will be at the Pablo Center at the Confluence, and a grandfather clock that will be part of a new welcome center to be built at UW-Eau Claire. After outlining recent successes during an annual speech, Eau Claire leaders spoke about persistent challenges facing the city including providing enough housing at prices residents can afford. Acting council President Andrew Werthmann and city Manger Dale Peters delivered the State of the City address Friday morning to about 100 community and business leaders gathered in a ballroom at the Lismore Hotel, 333 Gibson St.
“Affordable housing is one of the largest challenges our community faces,” Werthmann said. More than 100 people attended a listening session the City Council held last fall on the issue, and candidates running in the upcoming spring elections have been touting their stances on affordable housing on the campaign trail. On Monday, the City Council will see the results of the Chippewa Valley Housing Task Force, including 30 policy recommendations to address the housing shortage, Werthmann said. He recapped numerous policy changes enacted in the past year by the city’s political leaders. Among the highlights were adding library jobs to help the homeless population and improve early childhood literacy, setting an ambitious goal of running on entirely clean energy by 2050, adding a public input period to Monday night council meetings and banning a controversial type of therapy intended to change sexual orientation. “We put an end to the dangerous practice of conversion therapy for our LGBTQ kids,” he said. First elected in 2009 to the District 5 seat representing part of Eau Claire and re-elected since, Werthmann has been serving as leader of the council since Kerry Kincaid resigned her post as president in June. Among those in the audience Friday morning was at-large Councilman Terry Weld, who is challenging Werthmann for the council presidency in the April 2 election. Weld said he agreed with many of the city priorities mentioned in the speech. “Obviously these are all important things we should be focusing on as a community going forward,” Weld said. He defined the upcoming council president election more about leadership style. “I believe the council president should lead and not steer,” Weld said. He described his strengths as being independent, nonpartisan and able to bring neighbors, businesses and government leaders together to deal with city issues. Before talking about pressing matters, Friday’s speech did start with a look back on progress made in the past 10 years as Eau Claire emerged from the nationwide recession. “Our community has seen tremendous growth in the past decade,” Werthmann said. He added that many of the public and private sector leaders at Friday morning’s event, which was sponsored by the Eau Claire Area Chamber of Commerce, have been a part of that. Unemployment was 8.8 percent a decade ago in the city and it is 2.2 percent now — below state and national averages. There have been 3,000 jobs added in the city in the past 10 years and downtown’s value has risen by more than $100 million, Werthmann said. This year will bring a couple new sections of recreational trail, completion of Haymarket Plaza, road projects including major work on State Street, continued downtown redevelopment and reopening historic City Hall after a thorough renovation, Peters said. While Friday’s speech highlighted city services, projects happening this year and initiatives to deal with issues facing the community, Peters also mentioned the ongoing problem of funding. “Long-term, this current model of funding cities is not sustainable,” Peters said. Revenue fails to keep up with the rate of inflation, he said, which makes it tough to keep with the costs of running a growing city and satisfy demand for new services. Editor’s note: Best-selling author Nickolas Butler is among local writers who will be regular columnists in the Leader-Telegram. Look for their weekly columns starting in April. Wisconsinites pride themselves on toughness in ways that I’m sure are unimaginable in other parts of the country. Here I’m thinking of polar plunges, ice fishing, cross-country skiing, snowshoeing, snowmobiling, or even those cherished moments of paying to attend a Green Bay Packers game in subzero temperatures. I suspect your average citizen watching a Packers game in Alabama or Arizona is shaking their head at the television screen when they see us clad in hunter-orange on frigid Lambeau Field bleachers, or hunched over some hole in a frozen lake. They’re thinking, Who are these people? They must be crazy. We’re thinking, Look at us! We’re having fun! Cold? What cold? But after this winter, I’m not sure we can still brag about some sort of inherent toughness. Public schools in the Eau Claire school district (as of Feb. 20) have been canceled something more than a half-dozen times. Honestly, I’ve lost count. Folks, I grew up in Eau Claire. Went to public school from kindergarten all the way until senior year at Memorial. I don’t know if the schools were closed six times during that entire 12-year period. It’s difficult to write a column like this and not sound like a jaded old grumpus. But the spirit of the column is true, and troubling. It used to be that a snow day marked a rare meteorological catastrophe. I’m talking 20 inches of snowfall overnight, or temperatures below minus 30 degrees. These events might happen once a year, if at all. Snow days were met with celebration, and awe, as if a weather god had descended that morning, lightning bolts in hand and scared the living crap out of the school board. Wednesday was yet another 2018/19 snow day and as I looked out my bedroom window white, fluffy snow fell in a rather beautiful way. Looking outside, you would not guess that it was necessary to cancel school. You might think: a beautiful day to snowshoe out at Beaver Creek! Or, look at the cardinal at the bird feeder! Those red feathers sure look arresting against that white background! The thing is, our kids are watching us. They’re watching the ways in which we handle weather, and, in turn, challenges. This year, my children have not celebrated snow days, no. Rather, they’ve come to expect them anytime they glance out the window and see more than an inch of snow. Children have jobs too. Their job is school. And what the school district is telling them is, don’t bother trying to get to work if it’s snowing more than say — 3 inches. I’m not sure that I’m comfortable with this attitude. My family and I live at an incredibly dangerous intersection south of town on the apex of a high ridge. Our driveway looks like the Khyber Pass, a narrow, broken-down asphalt track that switchbacks up a steepish rise and is often shellacked beneath ice. About two weeks ago I had to tow a buddy’s minivan up the driveway with our truck and because I don’t have a good tow-rope (I should), I utilized a frozen garden hose. It was great. I felt like a true Wisconsinite. I was lathered in sweat from shoveling around his tires and carrying bags of salt up the driveway. I felt like we’d overcome nature, rather than avoiding it. I’m sure that administrators are calculating risk, safety, and practicality when they make the difficult decision to cancel schools. I don’t doubt that for a minute. But I know I’m not alone when I hear of school cancellations and think, What about the single parent who has to miss work? What about the families with two working parents who are using vacation days to manage children? And what about the kids depending on school breakfast or lunch? And, who are we anymore? Are we afraid of 3 inches of snow? Of 6 inches of snow? Of 9 inches of snow? And what is too cold? I suspect tornadoes are more deadly than blizzards, but we’re not canceling school when barometric pressures go wonky or spring temperatures spike and fall like the Dow Jones. There are facets of my life where I believe that safety for the common good trumps individual freedom. But there an increasing number of moments in my life when I feel like our first instinct (as a culture) is not to overcome or endure, but rather to succumb and mitigate. Our lives, evermore sealed off from the elements, evermore plugged into blaring media invested in disaster, heightens our fear of discomfort and inconvenience. My question is, does that jibe with what we imagine of ourselves? As Americans? As Wisconsinites? As citizens of this beautiful city? Maybe, our attitude towards the weather (and our lives) should be large measures of precaution and preparation, sure, but also endurance, steadfastness, a sense of humor, and the same backbone as our forebears, who, no matter their ethnic backgrounds, choose (for whatever reason) this wintry place on earth to call their home. Maybe, it’s time to get tough again. Nickolas Butler is the internationally best-selling and prize-winning author of “Shotgun Lovesongs,” “Beneath the Bonfire,” “The Hearts of Men,” and “Little Faith” (available March 5.) His books have been translated in over nine languages and optioned by Hollywood for film and TV. He lives with his family south of Eau Claire on 16 acres of beautiful land. Follow him on Instagram at @wiscobutler or on Facebook or Goodreads.